If we don't do it, our competitors will! Defensive Dealmaking or Panicky Preemption? My last post on Facebook’s acquisition of Whatsapp brought a whole host of responses, some of which took issue with my argument that it is easier to explain the deal using pricing metrics, especially ones that are used in the social media sector (# users) than with valuation models or logic. One of the arguments made by some of the commenters was that I was missing the real reason for the deal, which was that it was a defensive maneuver by Facebook, designed to both protect its profitability and to keep a prime competitor (Google) from acquiring Whatsapp. Many of these commenters also emphasized that these defensive deals cannot be assessed using conventional valuation techniques and that we have to trust management to make the right judgments on them. I don't have a bone to pick with the logic of defensive deal making, but as a valuation person, I don't agree with the claim that defensive deals cannot be valued. If preemption is the primary rationale behind an action, I believe that it not only can be valued but it should be valued. If you adopt a stilted view of valuation models (and DCF, in particular), it is possible that preemptive actions cannot be valued. However, I would argue that conventional discounted cash flow models provide more than enough flexibility to value preemption in all of its forms. To illustrate, let me set up a simple example. Let’s assume that Company A has $10 million in after-tax income (and cash flow) that it expects to generate in perpetuity on invested capital of $50 million and that it has a cost of capital of 10%. This company can be valued as a standalone entity at $100 million. Now, assume that this company is faced with Company B, a young company that has a product that has no revenues right now, but if allowed to develop or in the hands of a competitor, could eat into Company A’s market and lower its after-tax cash income to $ 6 million. Even though company B has little income potential on its own, company A should be willing to pay up to $40 million to acquire it. I know that you are looking at this example and arguing that it is far too simplistic to be used to explain Facebook’s acquisition of Whatsapp. While estimating the cash flows may be more complex with Facebook, you are, in effect, making the same argument. In fact, working through my discounted cash flow valuation of Facebook, I can work out the impact of that a potential competitor will have on the company's revenue/margins and the value of those cash flows, and by extension, how much Facebook should be willing to pay to remove that competitor from the game. The table, while looking at a wide range of outcomes, does provide some interesting insights into Facebook's vulnerabilities. First, the company's value is far more sensitive to margin erosion than it is to revenue loss, partly because the company has astounding high pre-tax operating margins (about 50%). Second, there are clearly combinations of revenue decline/margin drop that yield values greater than $19 billion. Note that this number will not be the total value of Whatsapp because it does not include the direct income and cash flows that you can generate from Whatsapp's business. You are welcome to try your hand on my spreadsheet that builds off the Facebook base case valuation to compute the effect on value of declining revenues and dropping margins. While it is easy to construct discounted cash flow valuations to justify acts of preemption, there are four conditions that have to be met for preemptive spending to be justified. The business you are defending is worth defending: Acting in defense of a business makes sense only if that business is a good one, and the measure of a good business is whether it generates returns on invested capital that exceed the cost of funding that business. If you own or run a bad business, spending money to defend that business strikes me as a pointless and expensive exercise. 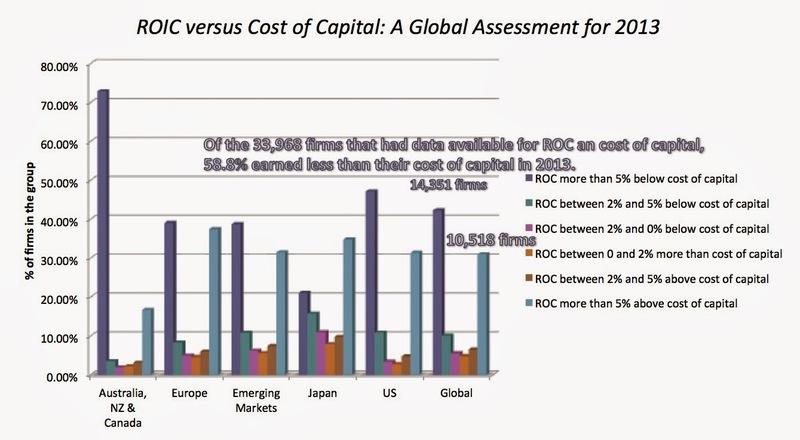 Lest this sounds like a weak precondition, note that by my calculations in 2013, about 60% of all listed companies (40,000+) globally generated returns that were below their costs of capital, and more than a third of them under performed by substantial margins (>5%). The threat is real, not imaginary: Spending preemptively to ward off a threat makes sense only if the revenue loss/ margin decline that is anticipated is real and is not just in the fevered imagination of the top management. While you can argue that this is a business judgment that should be left to the top managers of a firm, a paranoid CEO, egged on by “strategic” consultants and aided and abetted by bankers, eager to get the deal done, will find a hundred potential threats for every real one. The preemptive action is the most efficient (and cheapest) way to ward off the threat: Even if the threat is to a valuable business and is imminent, there may be less expensive and simpler ways to deal with the the threat then the chosen action. Thus, if you can acquire a technology from a company or exclusive licensing rights for a billion, you should not be spending $10 billion to buy the whole company. The threat is unique and not easily recreated: Spending money to eliminate a potential threat makes sense only if the threat is unique and not replicated easily/quickly. If the threat can be replicated easily, the spending company will find itself repeatedly spending larger and larger amounts of its depleting stock to make subsequent threats go away. These are companies with fragile business models with shallow ditches rather than competitive moats separating them from mediocrity. The question on the Facebook/Whatsapp deal is whether these conditions are met. As I see it, the first condition is easily met since Facebook clearly has a very profitable (and high return) business to defend. On the second and third, Facebook investors are, in effect, trusting Mark Zuckerberg's judgment that Whatsapp is a platform that may threaten Facebook's profitability and that buying out the company for $19 billion is the cheapest way to avoid that threat. It can be argued that he has earned their trust with the company's performance over the last two years. It is the fourth condition that should be most worrisome to Facebook investors. While Whatsapp may be a truly unique platform, the price tag on this deal is sure to entice young programmers, huddled around tables in Mumbai, Moscow and Menlo Park, to come up with new ways to breach Facebook defenses, knowing that they too will become wealthy beyond their wildest dreams, if they succeed. Looking at Facebook's short history, the price of preemption seems to be escalating at an exponential rate, going from $1 billion for Instagram more than a year ago to $ 3 billion for an attempted (and failed) acquisition of Snapchat to $19 billion for Whatsapp. (I know... I know.... There might have been other motives for the Instagram and Snapchat acquisition bids, but the price tag is climbing). Survival is not the end game: As I have noted in my prior posts, there is no glory in growth for the sake of growth or business survival for the sake of survival. A business is a commercial enterprise and if you cannot generate sufficient returns, given the risk you face and the capital you have invested, you should shut the business down. Doing nothing is not only an option but it may sometimes be a better one than doing something: We live in a world where activity is not only prized more than inactivity, but one in which there is far more money to be made by people from promoting activity (consultants, bankers) than from promoting inactivity. At the risk of sounding like stodgy, I believe that it is better sometimes to do nothing instead of doing something, especially if that something is ill advised or expensive. This graph looks at winners and losers in multiple-bidder acquisitions and looks at the returns that investors would have made in the 40 months after the deal is done. The stock price, on average, declines by about 35% in the deal winners and increases by 25% in the deal losers in that period. Companies often justify paying too much on acquisitions or making bad investments by using the preemption argument: if we don't do it, we will be hurt more than if we do. While that argument sometimes has economic merit, it deserves to be scrutinized just as much as any other investment decision. The tools for assessing the financial impact of these decisions not only exist but are straightforward. It is the will to make the assessment that is lacking at most businesses. While I have framed this post in terms of the Facebook/Whatsapp deal, I continue to believe what I said in my first post. I don't think that Facebook's management is doing this deal for defensive reasons or because they have explicit plans for generating value, at least as of now. It is Whatsapp's large, growing and engaged user base that makes it so attractive to Facebook, especially given how much the market is pricing all of those factors. You may find it difficult to believe that someone as smart as Mark Zuckerberg would pay $19 billion without a clear vision of how he plans to make money off the deal, but I don't. In December 2012, I did a series of posts on acquisitions that reflected my dyspeptic view of their impact on value. In perhaps a test of my cynicism about the M&A process, Comcast last week announced that it was making an offer to buy the equity in Time Warner Cable for $45.2 billion. As the two largest players in the market contemplated consolidating their cable operations, “synergy” reared its head again as a potential rationale for the premium being paid by Comcast for TWC's shares, just as consumer groups and anti-trust regulators warily eyed monopoly power. While the market's initial reaction to the announcement was not favorable to Comcast, it does provide a test case of how synergy affects value and what acquirers should pay for it. The first step in assessing the merger is to go back and look at the state of play at the two companies, run independently, prior to the acquisition bid. 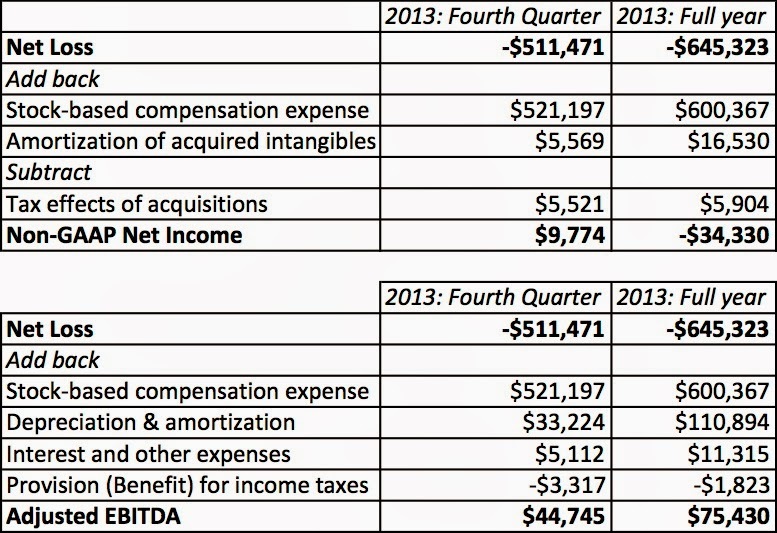 Using the 2013 financial statements that are available for both firms, that is where I started the analysis. To compute the cost of capital, I incorporated two additional inputs. 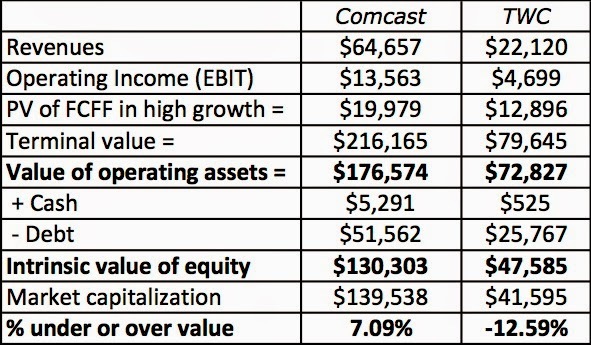 The first was a beta(s) for the business(es) that these companies were in, which in conjunction with estimated values for each business, yielded business (asset) betas of 0.896 for Comcast (because it derives a significant portion of its revenues from broadcasting, through its ownership of NBC) and 0.71 for TWC. The second were the bond ratings for the two firms: Moody's gave Comcast a bond rating of A3 (with a default spread of 1.30% associated with it) and TWC a bond rating of Baa2 (with a default spread of 2.25% over the risk free rate). Note that the numbers are adjusted for the capitalizing of leases. Both firms generated healthy cash flows in 2013. Based on the 2013 numbers, Comcast is investing a healthy portion of its after-tax operating income back into the company (perhaps in NBC Universal) and can be expected to grow 5.10% a year. TWC seems to be just maintaining its capital base (with a reinvestment rate of only 5.88%) and its expected growth is minimal (0.61% a year). Based on my estimates, it looks like Comcast was over valued by about 7.1% prior to this deal and Time Warner was undervalued by about 12.6%. These stand alone valuations also provide us with a measure of what the combined firm's operating assets would be worth, if there were no synergy, since values are additive. 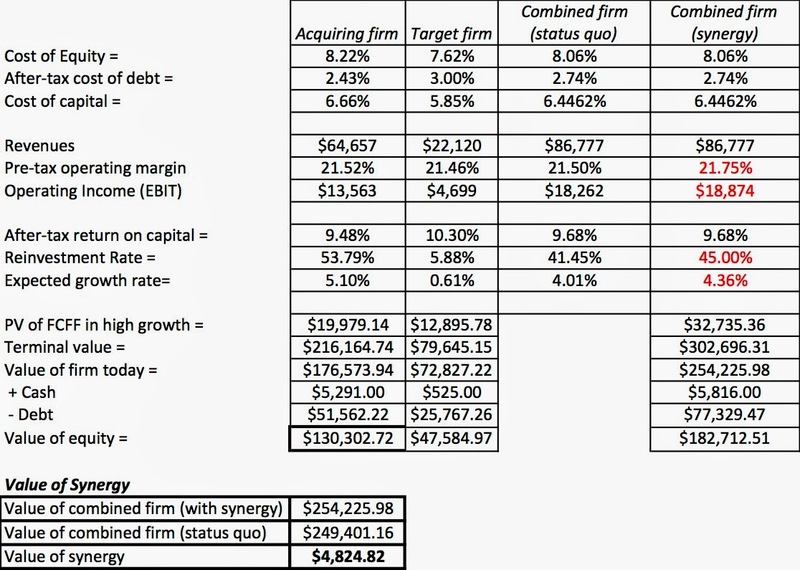 This is the base value that we can compare the value of the combined firm, with any foreseen synergy. With financial synergies, you are looking at the possibilities of recapitalizing the combined firm to generate a cost of capital that would be lower than the one you would arrive at by just aggregating the existing capital mixes of the two firms.. Looking at the combined firm, there seems to little potential for significant changes in value from altering financing mix. Both companies use healthy amounts of debt, with Time Warner perhaps a little over levered and Comcast a little under levered. At best, the combined firm may be able to generate marginal savings on its cost of debt and perhaps a slightly higher debt ratio than 30.3%, which is the combined firms aggregated statistic. With operating synergies, you can roam wider and look for the potential for added value by either operating income in the near term, increasing expected growth or both. Increased revenues: On the cable part of the business, this would mean increasing cable or broadband bills at a rate higher than they would have, if they remained independent firms. While there has been some talk (from analysts) of this happening, the combined firm will be stymied by two factors. The first is that the regulatory authorities will be reviewing the effects on competition of this merger and it is very likely that increasing bills right after a merger will be viewed as a monopolistic act. The second is that while there is some talk about the absence of competition, it is worth noting that ___ of Americans under the age of 30 no longer have cable and are increasing getting their entertainment from Hulu, Netflix and other providers though they are still dependent on broadband. Increasing cable rates will only accelerate that flight. We will assume that there will be no near term increase in the combined firm's base revenues. Higher operating margins: For the combined firm to be able to increase margins, it has to be able to cut costs. To the degree that they have overlapping costs, that is certainly feasible but large portions of their businesses do not overlap and cost cuts are likely to be difficult. In addition, both firms are reporting healthy operating margins, in excess of industry averages, removing the easy cost cuts that may have existed, if one or both firms had bloated cost structures. We will assume that the combined firm's pre-tax operating margin will increase slightly from 21.50% to 21.75%. Lower effective tax rates: Both firms pay 32-33% of their income in taxes, much higher than the average effective tax rate across all US companies (closer to 28%). However, one reason that they pay these higher taxes (and may be unable to change easily) is that they generate the bulk of their income in the United States. We will assume that there is no potential for tax savings at the combined firm. The framework for estimating growth that we used for the standalone valuations was based upon how much the firms were reinvesting (the reinvestment rate) and the return that they generated on that invested capital. To the extent that the combined firm is able to reinvest more or reinvest better, it may be able to deliver synergy from growth. Reinvestment rate: The aggregated reinvestment rate for the combined firm is 41.45%, weighed down by the low reinvestment at Time Warner Cable. While we have no basis for the contention, it is possible that the low reinvestment at TWC may be driven by capital constraints and that Comcast may be able to reinvest more, though the nature of the cable business will restrict how much. We will assume that the reinvestment rate for the combined firm will be 45%, up from 41.45%. Return on capital: The aggregated return on capital for the combined firm is 9.68%. While there may be some marginal benefits from the merger, we will assume that the increased reinvestment will act as a counter weight. We will leave the return on capital unchanged at 9.68% for the combined firm. The good news is that even small changes in operating margin or tweaks in the cost of capital translate into large changes in combined value. With the changes I assumed, the increase in value at the combined firm is $4.82 billion, an increase of 1.9% over the status quo (no synergy) combined value. The bad news is that even these small changes will take effort and time. The former will require commitment on the part of Comcast’s management (and accountability) and the latter will reduce the value of the synergy (by the time value factor). In the graph below, I summarize the value of synergy as a function of the improvement in operating margin and the number of years spent waiting for synergy to show up. I am not a Comcast stockholder, but if I were, this analysis would leave me feeling a little more comfortable with the acquisition than I would have been a few days ago. The under valuation of Time Warner (at least based on my estimates) in conjunction with even small improvements in operating margins provide enough surplus to cover the premium. In fact, the under valuation of TWC prior to the merger (at least based on my estimates) provides some buffer for Comcast. In fact, the numbers can also be used to make a judgment on whether Comcast's stockholders are begin ill served by the proposed exchange ratio on this deal. At the proposed exchange ratio of 2.875 Comcast shares/TWC share, the deal is tilted in favor of Comcast shareholders, at least based on my estimates. The bottom line is that while this is a high-priced deal and there is plenty that can go wrong (from a regulatory and business standpoint) in the future, it does not strike me as a value destructive deal and may, in fact, create value for Comcast stockholders. As always, please do feel free to download the spreadsheet that I used to value the synergy, tweak it or modify it and come up with your own assessments that you can put into this shared Google spreadsheet. When large acquisitions are announced, it is natural to focus attention on the target company and shareholders in that company are generally celebrants. This acquisition was no exception, as TWC’s market capitalization increased by $2,779 million on the announcement of the merger, an increase of 7.4% over the pre-merger value, but well below Comcast's offer of $45.2 billion. To me the more interesting side of the action is on the acquiring firm, since stockholders in the firm get a chance to pass judgment on whether they see themselves as winners or losers, from the deal. In this merger, Comcast’s market cap dropped by $4,509 million, a decline of 3.13% in value. In sum, if you combine the market capitalizations of the two companies, there was a decline in $1,730 million in value after the announcement. I don't know whether this reflects pessimism on whether the regulators will allow the merger to go through or synergy benefits, but it does seem like the reaction is not warranted by the facts. I continue to believe that growing by acquiring publicly traded companies at a premium is a difficult game to win. However, I also believe that some acquisitions can create value, if you can target under valued firms and generate some synergy benefits in the process. In my last post on Twitter, I argued that the firm's claim that it actually made money in the last quarter of 2013 was fiction. That may sound like an exaggeration, since the company is transparent about the adjustments that it made to get to its adjusted numbers and the practice it uses is widespread not just among companies, trying to better a better face on their operating results but also among analysts who track these companies. In particular, the biggest factor in the earnings transformation was the company's treatment of stock-based employee compensation, which was added back to arrive at the adjusted earnings. Twitter's adjustments shifted a fairly substantial loss exceeding half a billion into both net profits ($9.774 million) and positive EBITDA ($44,745) in the fourth quarter. The dominant add-back in both adjustments is the stock-based compensation of $521.2 million and while it may be sanctioned by accountants, I am struggling with the logic of why. Attempting to give Twitter, the benefit of the doubt, the rationale for adding back the expense to get to adjusted EBITDA is that it a non-cash expense (though I will take issue with that claim later in this post), but that cannot be the rationale for adding it back to get to net profit, since net profit is an accounting earnings number, not a cash flow. One possible explanation that can be offered (and it is a real stretch) is that Twitter views stock-based compensation as an extraordinary expense that will not recur in future years and that the adjusted net income should therefore be viewed as a measure of continuing income. 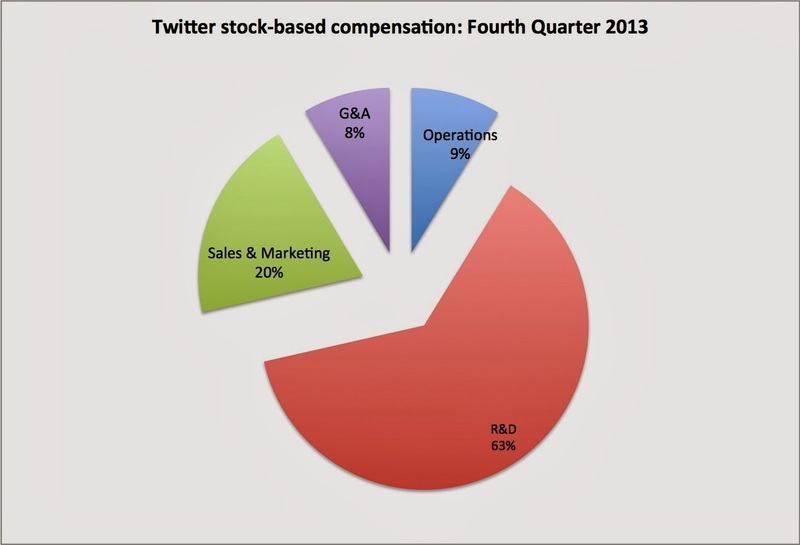 I will believe this explanation, if I see Twitter stop using stock-based compensation, but I don't see how they can afford to. They have a lot of employees, some of whom are highly paid, and they cannot afford to pay them cash. The other explanation is that the adjusted net income is being divided by the fully diluted number of shares outstanding, which includes the shares that are being offered as compensation. This "consistency" argument is used by many analysts, and while it may offer the fig leaf of matching , it is an extremely sloppy way of dealing with stock-based compensation. To understand where we are with stock-based compensation, let's start with a quick review of its history. 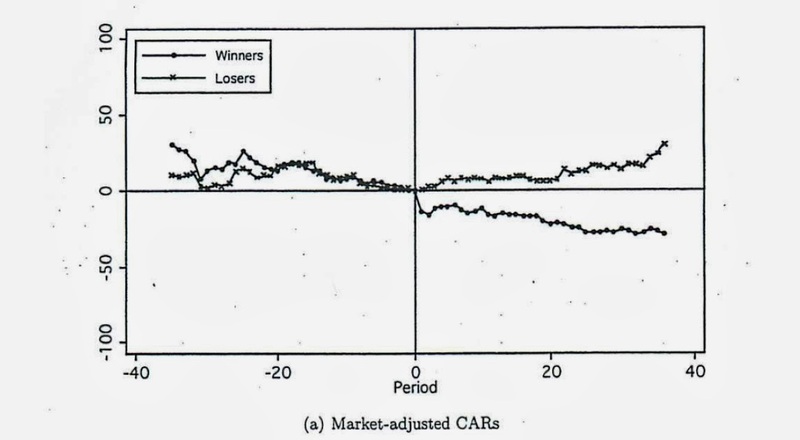 While businesses with cash flow problems have always used equity based compensation to attract employees, there was a quantum leap in the use of stock-based compensation by publicly traded companies in the 1990s, driven partly by bad legislation (limiting executive compensation), partly by the entry of young, technology firms into the public market place and partly by bad accounting practices. In particular, accounting rules allowed companies to grant options to employees and show no cost, at the time of the grant, if the options were at the money. Not surprisingly, companies treated as options as free currency and gave away large slices of equity in themselves to employees (and, in particular, to the very top employees), while claiming to be spending no money. If and when the options were exercised later, companies would report a large expense (reflecting the difference between the stock price at the time of the exercise and the exercise price) and show that expense either as an extraordinary expense in the income statement or adjust the book value of equity for it. After a decade of fighting to preserve this illogical status quo, the accounting rule makers finally came to their senses in 2006 and changed the rules on accounting for option grants. Companies were required to value options, as options, at the time of the grant and expense them at the time (with the standard accounting practice of amortizing or smoothing out softening the blow). This is the law that is triggering the large stock-based employee option expenses at Twitter and other companies like it, that continue to compensate employees with equity. It is worth noting that the change in the accounting law has also resulted in many companies moving away from options to restricted stock (with restrictions on trading for a few years after the grant), since there is no earnings benefit associated with the use of options any more. Stock-Based Compensation: Expense or not? Operating or Capital? Cash or non-cash? Stock-based compensation is embedded in many US corporations and it is increasingly finding a place in companies that are incorporated in other countries as well. Two decades after they became part of the landscape, there still seems to be a lot of confusion about their place in the financial statements and how exactly they should be viewed. 1. Is it an expense? This is an easy one. Of course! If you look at why and where companies use stock-based awards, it is more used early in a company's life cycle and it is used to compensate employees. As Warren Buffet is famously quoted as saying, "If options aren't a form of compensation, what are they? If compensation isn't an expense, what is it? And if expenses should not go into the calculation of earnings, where in the world should they go?" The timing of the expense is also clear. It is at the time of the grant, and arguments that use uncertainty about whether these options will be exercised in the future to justify not expensing them are specious. We are uncertain about almost everything that has to do with the future, but that does not stop us (or should not stop us) from making our best estimates at the time that we encounter them. 2. Is it a capital or operating expense? An argument can be made that R&D expense is a capital expense, not an operating one, and that it should treated as such. I concur with the sentiment (though I don't know the classification system that Twitter used to determine the breakdown of stock-based compensation). and I did capitalize R&D expenses in my Twitter valuation. However, that does not give you a license to just add back the expense, since capitalizing it will result in an asset that has to be depreciated; see this paper that I have on capitalizing R&D, if you are interested. Thus, if Twitter wanted to use this rationale, it should have added back just the R&D portion of the stock-based compensation and then subtracted out the depreciation on the synthetic asset it creates. 3. Is it a non-cash expense? Many equity research analysts seem to think so, but then again, their judgment on a number of fundamental valuation issues remains questionable. Let's be clear on what it is not. It is not an expense like depreciation, which is truly non-cash and should be added back to get to cash flow. It is closer in spirit to an in-kind compensation than a non-cash compensation. To explain my reasoning, let me use an analogy. Let's assume that you own and run a business that has an overall value of $100 million and generates $10 million in annual income. Let's assume that you hire me as your manager and that my compensation is $1 million and that rather than pay me with cash, you give me 1% of the business as compensation (1% of $100 million is $ 1 million). While you may maintain the fiction that this is a non-cash expense and that your income is still $10 million, you are now entitled to only 99% of that income in perpetuity. In effect, your share of the business is worth less and it will get even smaller over time, if you continue to compensate me with equity. I would argue that as common stockholders in any company that grants options or restricted stock to its employees, we are in exactly the same position. The stock-based compensation may not represent cash but it is so only because the company has used a barter system to evade the cash flow effect. Put differently, if the company had issued the options and restricted stock (that it was planning to give employees) to the market and then used the cash proceeds to pay employees, we would have treated it as a cash expense. In closing, then, we have to hold equity compensation to a different standard than we do non-cash expenses like depreciation, and be less cavalier about adding them back. To those analysts who argue that using the diluted number of shares to compute per share numbers will take care of the problem, my response is that it will do so only by accident (as I hope to show at the end of this post). a. Continuing Earnings/cash flow impact: If you are valuing a company that is expected to continue paying its employees with options and/or restricted stock, your forecasted earnings and cash flows for the company will be lower than for an otherwise similar company that does not follow the same practice. These lower cash flows will reduce the value of the business and equity today. b. Deadweight effect of past compensation: If a company has used options in the past to compensate employees and these options are still live, they represent another claim on equity (besides that of the common stockholders) and the value of this claim has to be netted out of the value of equity to arrive at the value of common stock. The latter should then be divided by the actual number of shares outstanding to get to the value per share. (Restricted stock should have no deadweight costs and can just be included in the outstanding shares today). While it may seem like you are double counting options, by first reducing earnings for their grants, and then again reducing the overall value of equity for outstanding options from the past, you are not. In fact, if a company stops using equity-based compensation after years of option grants, the first effect (on earnings/cash flows) will stop but the second effect will continue until all of the options either expire or are exercised. If you look at my Twitter valuation in February 2014, you will see both effects in play. Since I don't follow Twitter's practice of adding back stock-based compensation, I forecast losses/negative cash flows for the company for the first few years before the scaling effects kick in: as revenues get larger, employee compensation will become a smaller percentage of those revenues (just like other fixed costs). The value that I get for the operating assets today incorporates these negative cash flows and is thus lower because of the generous stock-based compensation at Twitter. Once I get the value of the operating assets, I deal with the deadweight cost of past option grants by valuing the 42.71 million options outstanding at $2.182 billion, primarily because the options have an average exercise price of $1.84 (well below the current stock price) and subtracting this value from the overall value of equity of $13.6 billion, before dividing by the actual number of shares (including restricted shares) of 555.2 million. Based on this comparison, company C would look cheapest and company A most expensive but only because of the way that we deal with stock-based compensation. In fact, the biases become worse as companies continue to grant options and the disparity between primary and diluted shares grows. So, what should you do, if you have to use multiples? First, stop adding back stock-based compensation to net income. There is no logical or financial rationale for doing so. Second, stop playing around with the denominator. If there are shares outstanding, restricted or not, count them. If there are options outstanding, value them and add them to the numerator (the market capitalization) and don't adjust the shares outstanding for in-the-money, at-the-money or out-of-the-money options. The same rationale applies if you are using EV/EBI/TDA or price to book ratios. Analysts, accountants and appraisers seem to still be struggling with how best to deal with stock-based compensation, whether in the form of options or restricted stock. I think the answers lie in going back to basics. There are no free lunches and if a company chooses to pay $5 million to an employee, that will affect the value of my equity, no matter what form that payment is in (cash, restricted stock, options or goods). There are reasons why one form may be better for some companies and another for different companies but these should not be cosmetic or based on adjustments (real or imaginary) that companies and analysts may make to earnings and per share values.